Global demand for air travel continued to rise in August, driven by robust growth in Asia-Pacific and the Middle East, the International Air Transport Association (IATA) said on Thursday. Air passenger traffic in terms of revenue passenger kilometres rose 7.1 per cent in August, against an 8.2 per cent increase recorded for July, IATA said in its monthly passenger data release. IATA on Thursday said India’s domestic passenger traffic demand grew the fastest among seven major aviation markets of the world — Australia, Brazil, China, Japan, Russian Federation and the US. “India’s domestic demand surged 18.3 per cent in August (2015) compared to a year ago, largely reflecting increases in service frequencies and economic strength,” IATA said. India’s growth was followed by China at 13.6 per cent and the Russian Federation at 10.9 per cent. India’s domestic traffic rose 28 per cent in July, 16.3 per cent in June; 18.2 per cent in May, 20.7 per cent in April and 17.9 per cent in March 2015. August’s 18.3 per cent growth, though lower than the growth registered in July, was the fastest globally for that month. India’s domestic capacity in the month under review rose 8.4 per cent compared to August 2014. “August figures show continuation of the trend of strong demand for air travel, despite some softening in global economic growth, particularly in emerging markets,” said Tony Tyler, IATA’s DG and CEO. “Airlines are committed to meeting growing demand sustainably. The record high load factor of 84.7% is a great indicator of improved efficiency – a 17 percentage point increase over the industry’s performance a decade ago. This is just one indicator of the aviation industry’s determination to achieve carbon neutral growth from 2020,” said Tyler. 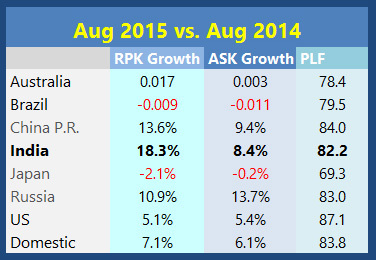 August traffic surged 7.7% compared to the year-ago period in Asia Pacific. Capacity rose 5.8% and load factor increased 1.5 percentage points to 82.5%. While emerging Asia has experienced notable declines in trade activity this year as well as slower than expected growth in China, neither factor appears to be impacting international air travel on the region’s carriers.